Admired and appreciated in his native Mexico for his artistry, as well as his impassioned belief in the civil rights of his fellow countrymen, Rivera is best known internationally for his immense, decorative murals. His beautifully stylized works depicting peasant occupations, costumes and popular personalities were vigorously expressed using simplified, classical forms and bright color. As a child he showed great promise with his drawing and his father enrolled him in art school at an early age. He studied at the San Carlos Academy in Mexico City and in the carving workshop of artist Jose Guadalupe Posada, whose influence was decisive. Later in Paris, he absorbed the influence of Modernism and Cubism. His work had a powerful effect on many Abstract Expressionist painters, notably Jackson Pollock. His influential social and political beliefs were publicly censured when his 1933 mural design for Rockefeller Center was banned by Nelson Rockefeller, then director of The Museum of Modern Art, New York, after discovering that Rivera was a Communist. 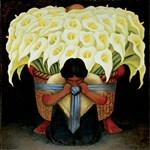 Rivera was most admired for his ability to capture significant moments in Mexican history and make his art public, on streets and buildings, with a realist style that was full of social content. Image Size: 12" x 14"
Image Size: 15" x 20"
Image Size: 25" x 23"
Image Size: 21" x 25"
Image Size: 20" x 21"
Image Size: 33" x 38"